Fundraiser for Diana Theriault by Wanda Hayden : Help Gregg fight for his life! Help Gregg fight for his life! 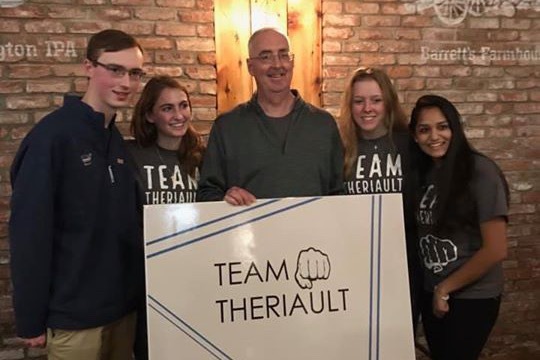 Gregg Theriault and his family are battling for Gregg's life after he was just diagnosed with Glioblastoma Stage 4 Brain Cancer. Over the past few months, Gregg's wife of 22 years, Diana, and their three children, Paul, Elizabeth, and John, all noticed that something with Gregg wasn't quite right, but they were unsure what that might be. Gregg had gone through a tough summer with the death of his beloved Mother-in-law and had recently got laid off from his job of almost thirty years. His family thought these traumatic events may have played a role in his changes, he had trouble recalling things. As a result, Gregg made an appointment with his primary care doctor in mid-October. The results prompted Gregg's doctor to schedule an MRI for Sunday, October 21st. 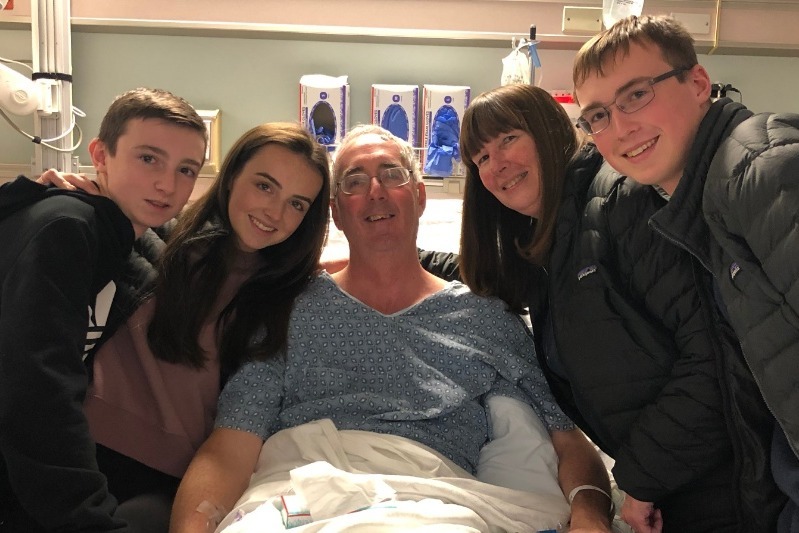 Gregg and his family got a call first thing Monday morning from his doctor, telling him to go immediately to the emergency room at Beth Israel Deaconess Hospital in Boston. On Tuesday morning Gregg was told that he had a large brain tumor, which the Chief of Neurosurgery believed had all the signs of being malignant. On Thursday, October 25th, Gregg had brain surgery. After the four hour surgery, the family was informed that Gregg has Glioblastoma Stage 4 Brain Cancer. We are told there is no cure for this type of cancer. This news is devastating to Diana, Paul, Elizabeth, and John and their extended family. The last few weeks seem like a nightmare to all of us, but unfortunately, it is our new reality. We have been told that Gregg is terminally ill and he may live another 12-18 months if he continues with an aggressive course of treatment including chemotherapy, radiation, and perhaps additional surgeries. Gregg has a great attitude and is extremely brave. If you know him, we're sure you would agree that he is a fantastic person, amazing father, and a loving husband. Gregg's young children are smart and very close to their father, and our hearts break for them. Diana is the strongest person we know, but she's going to need an immense amount of help to get through this challenging time. She needs to support Gregg's needs and care for her three teenage children. There are so many expenses that aren't covered by insurance such as insurance deductibles, home nursing care, and some trial programs and treatments. In addition, Gregg is now disabled and can't work. Anything you can do to help Gregg and his family would be greatly appreciated. We encourage you to learn more about this extremely aggressive and deadly form of cancer. Thank you for taking the time to listen to Gregg's story. We pray his story has a better ending than what we've been told. Thought I would send out a quick update since I’ve been getting lots of emails and texts asking how Gregg's been doing. Do you have a bucket list of things you want to do in your life? How often do you actually do the things on that list? It's all so easy to get lost in the day to day life and to put the things on your bucket list into the "someday pile." Gregg has decided that making his dreams on his bucket list come to life is his top priority. The week of March 9th-March 17th Gregg was thrilled to put a BIG check next to his number one item on his bucket list. Overall, Gregg did better than we had expected with his health during our trip. We did notice some increased memory issues, more bruising than usual and some balance issues. 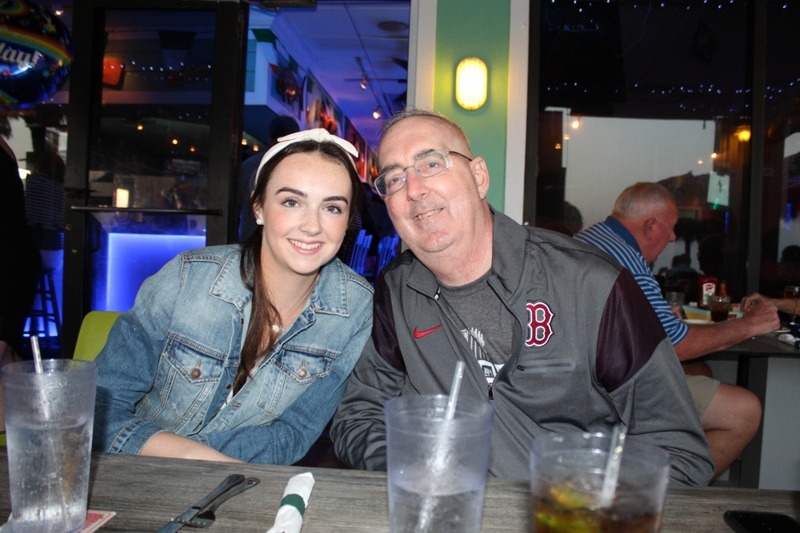 Yesterday, Gregg went to Dana Farber for another brain MRI and to discuss if Gregg’s platelet levels were high enough to start the Avastin treatment. The results of the MRI once again reminded us of just how aggressive and deadly this cancer can be. The MRI didn’t yield the results we had hoped for. The tumor has continued to show growth and Dr. Reardon is extremely concerned that we will start to see some significant changes in Gregg’s health if we don’t try the Avastin. We talked at length about the side effects and we decided that giving the Avastin a try was the only hope at this point to try and extend Gregg’s life. Needless to say, this was a long exhausting day. Gregg has a lot of fight left and he isn’t a quitter. Gregg plans to fight this beast hard, to the very end. I want to say a huge thank you for all the continued love and prayers everyone has been sending our way. I know Gregg and our family will get through this with the support we've been receiving from all of you! All our love and thanks! On February 19th Gregg had another MRI. The purpose of this MRI was to compare the results to the previous MRI on 1/28/19. Dr. Reardon at Dana Farber also wanted to use the MRI to evaluate if Gregg could possibly receive an infusion treatment called Avastin once his platelets reached a safe level. The good news is that the tumor didn’t show any significant changes. The previous MRI was only 3 weeks from this last MRI. Unfortunately, Gregg has continued to have complications with his platelets which has continued to make no treatments including the Avastin an option for him at this time. Since December 22nd Gregg has had the low platelet complications. He has tried platelet transfusions and a NPlate injection. 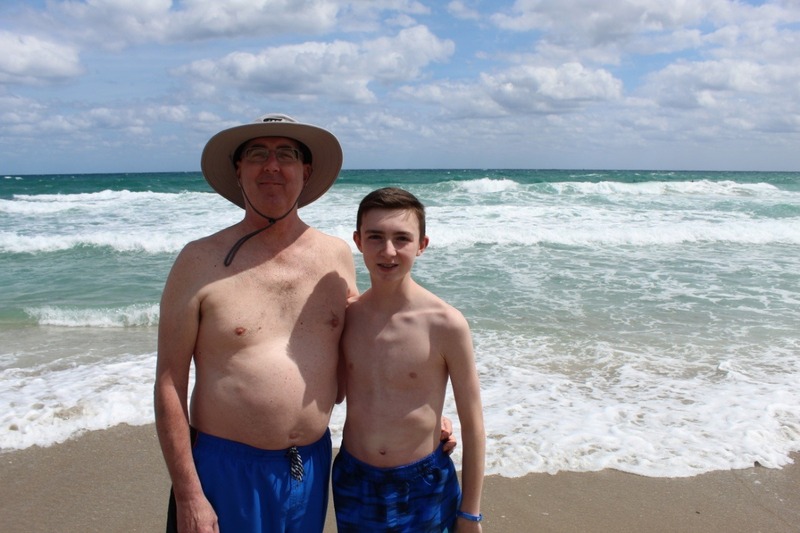 The Hematologist and Oncologist at Dana Farber were confident that the NPlate injection would work and get Greggs platelets heading in the right direction. After 4 weeks of weekly injections this hasn’t been the case. One week the platelets dropped and last week they stayed the same. I think the doctors at Dana Farber are baffled and tell Gregg that it seems that each treatment he tries, he’s in the lowest percentile of people who have these types of complications. The doctors are unable to pinpoint why Gregg keeps hitting all of these road blocks. Gregg has continued to focus on making memories and enjoying times with his friends, family and loved ones. 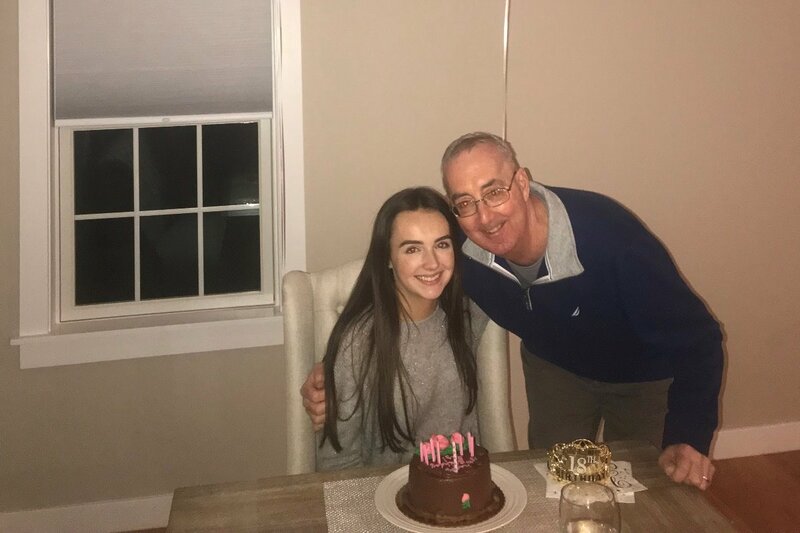 This past Thursday we celebrated Elizabeth's 18th Birthday. WOW… just wow. There are no words for the gratitude our family feels right now. 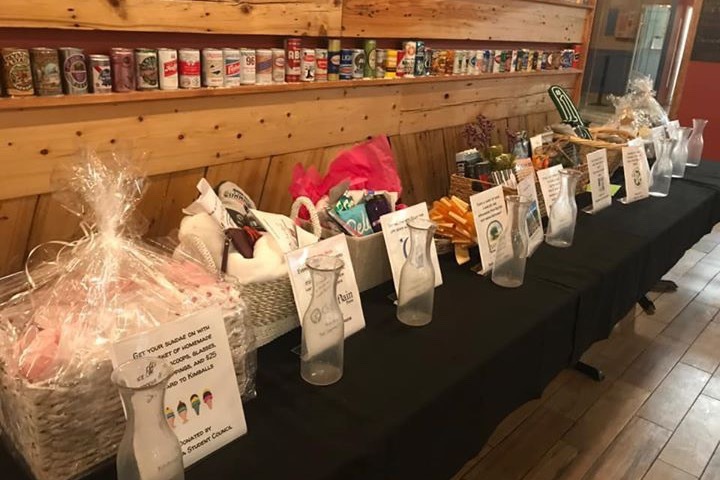 We are overwhelmed by the outpouring of support and love at last night’s fundraiser at the Battle Road Brew House. The last few months have been challenging and Gregg’s treatments have not yielded the results we had hoped for. However, seeing our community, friends, and family all come together for Gregg and our family last night, let us live in the moment without thinking about anything except for how lucky we are to know you all. We are so grateful to all of you for sharing last night with us. The hugs, warm words, tears, and laughter meant more to us than you will ever know. 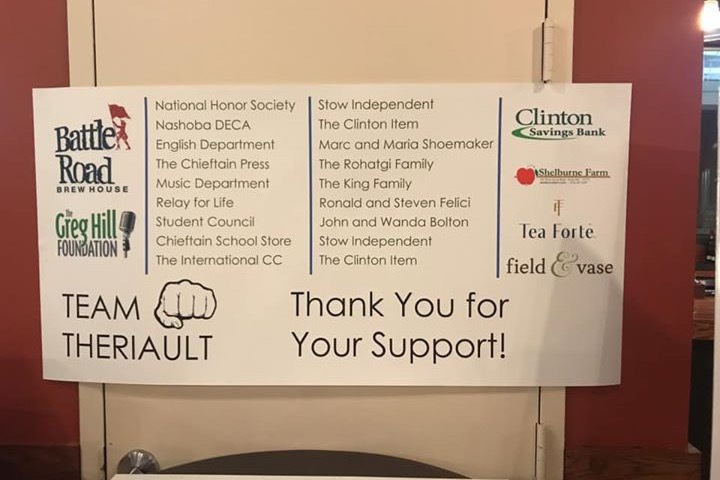 One thing that permeated with us this morning when we looked back at last night, was the fact that this amazing event all began with three high school students. Colleen Pokorney, Kajal Rohatgi, and Bailey Schiering all members of the DECA team at Nashoba Regional High who teamed up with their advisors Mr. Andreopoulos and Ms.Grigas, the Greg Hill Foundation, Battle Road Brew House, Clinton Savings Bank, local businesses and community members to put this event together. We are so grateful to you all for the hard work and donations. Thank you to the Battle Road Brew House and Greg Hill Foundation who did an amazing job creating a fun environment, great food and drinks. We also want to send a shout out to the talented past and present Nashoba students who provided the awesome entertainment! Last evening was another great reminder of the incredible community we live in. It is also a wonderful example of the incredible kids we are raising and the impact they can have on the world. Our hearts are exploding thinking about what a wonderful time we had last night. Gregg’s diagnosis was devastating to our family and the rollercoaster of treatments, doctors’ appointments and unexpected complications have made our life very difficult. However, after last night everything seemed a little brighter this morning. Seeing the effort that was put into this incredible event and all of our friends and family coming to join our community to support us makes us realize that we are not in this alone. Many of you have been emailing and texting to see how Gregg made out with his appointments this week. We appreciate the prayers, love and support you’ve been sending our way. Gregg had two appointments this week. The first was on Monday for a Brain MRI at Beth Israel and the second was an appointment at Dana Farber with Neuro-Oncology. Yesterday was a long day at Dana Farber. 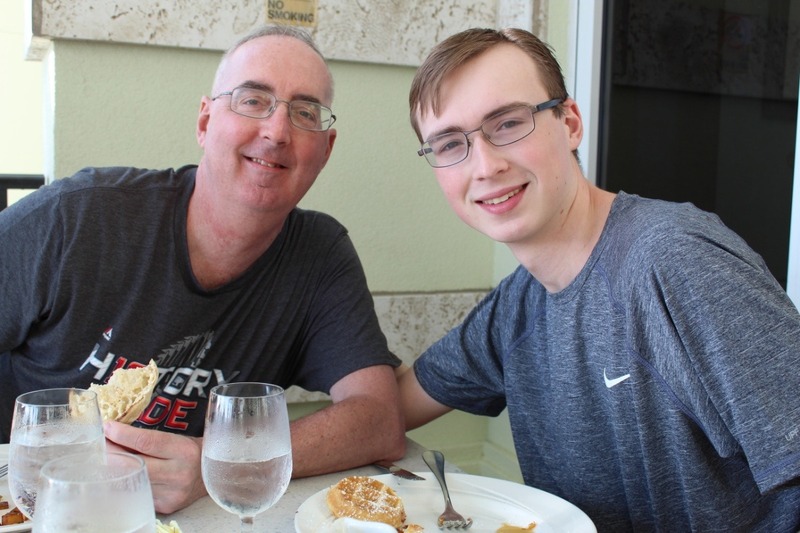 We discussed Gregg’s continued blood issues most importantly his low platelet counts that caused him to stop his chemo treatments about half way through back in mid-December. It has been about 45 days since Gregg stopped chemo and his platelets haven’t increased--remaining in the critical range. A very small percentage of people have such extreme problems with platelets while taking chemo. During our appointment at Dana Farber they encouraged us to get some bone marrow testing completed to see if we can see if the bone marrow has failed from the chemo or for another reason. Gregg’s doctor, Dr Reardon at Dana Farber also discussed Gregg’s recent MRI with us. We were devastated to hear that there was significant inflammation in Gregg’s brain and that the tumor area is active again. We were also told the smaller tumor that couldn’t be removed at the time of surgery had changed in size. About 5%-10% of patients with Greggs type of tumors grow right through even with treatment. The first choice of treatment for Gregg right now would be another surgery, but due to his low platelet count and risk of bleeding and hemorrhage that isn’t an option until his platelet counts increase. The plan moving forward is for Gregg to get the bone marrow testing in the next few days and to hopefully start taking medication that will help his bone marrow make more platelets. Once his platelets increase chemo will be an option again and probably another surgery. Gregg will also try wearing an OPTUNE DEVICE on his head 18-20 hours per day. The OPTUNE DEVICE treats glioblastoma by interrupting the process by which cancer cells divide and spread. The device is placed on the head and produces wave-like electric fields. These electric fields slow or prevent the way cancer cells multiply. This device is usually used with chemo, but in Gregg’s case since chemo isn’t an option at this time the doctor suggested we try it alone. We were hoping for better news this week, but we’re taking each day as it comes. The kids have settled back into school after the holidays and have been amazing, even though some days are more challenging than others. We are trying to stay strong. Gregg reminds us often that he is giving this a good fight! A BIG week end ahead with the Super Bowl. Gregg is focusing on that since the kids will all be home to watch the game with him. GO PATS! Thanks to all that have been checking in and sending kind words, love and prayers. Gregg and our family will get through this with the love and support we've been receiving from all of you!! All our love!